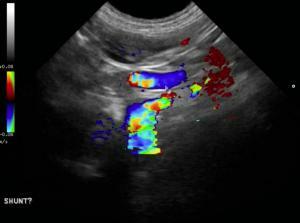 Tortuous splenoazygos shunt with normal portal vein volume prior to the shunt and diminished portal vein volume after the shunt typical of portal vein "step down" of volume at the point of shunting. 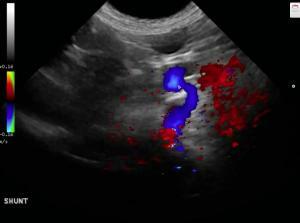 Dorsally directed CF positive Splenoazygos shunt in blue., remember BART on color flow. Blue away and red towards the transducer. EHPSS is always blue in these positions not to be confused with the celiac and hepatic arteries which are red but run parallel to the shunt. Dorsally directed CF positive Splenoazygos shunt with mosaic turbulence. 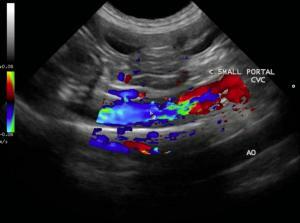 Color flow positive Double Aorta seen below the vena cava on the screen. Lindquist virtually analyzing a "Shunt Hunt" from SonoPath telemedicine client Calin Catarig, DVM. We call these "SonoPodcasts" to help interpret the case at hand with virtual learning. See this innovative instructional tool we use with our telemed clients here at SonoPath which are then added to our extensive SonoPodcast archive for sonopath members to learn from. 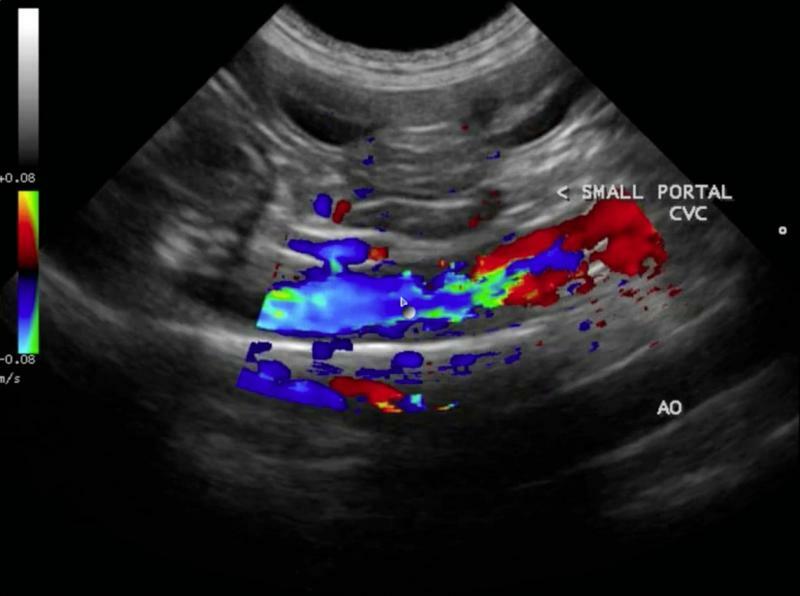 See how we can remotely define this portosystemic shunt with techniques taught through virtual means on how to diagnose a shunt sonographically. Stay with this 13 minute video and be sure you give it time to download if on a slow connection because Dr. Catarig got the necessary rock star views to diagnose this spleno-azygos shunt. Nice job Calin! You are now part of the SonoPath Shunt Hunt Club; telemedicine clients that can reliably image portosystemic shunts in the field worldwide after virtual instruction by Lindquist & Sonopath specialists. Liver - porto-systemic shunt, primary portal vein hypoplasia, acute hepatopathy (viral, bacterial, leptospirosis, toxins), chronic-active hepatitis, neoplasia. Pancreas - pancreatitis, abscessation, neoplasia. Splenoazygos shunt. Severe microhepatica. Bladder sand. 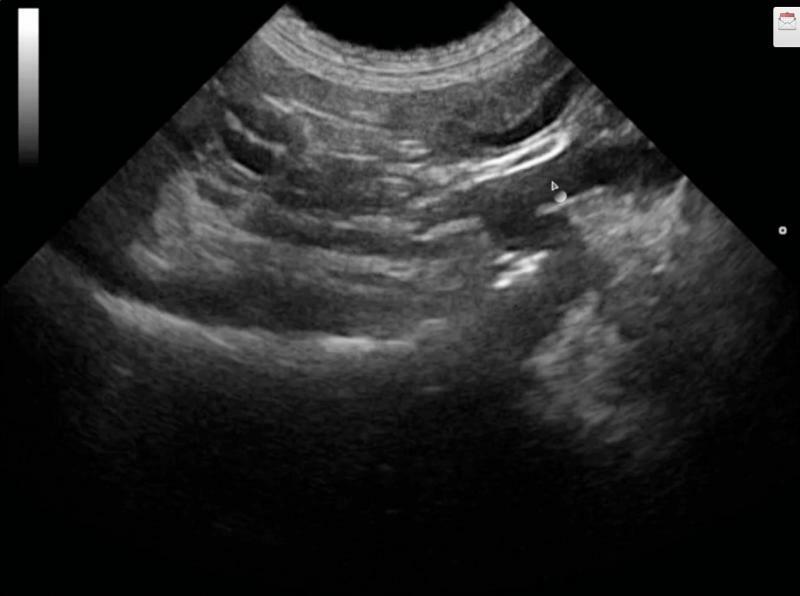 This case was submitted for SonoPodcast consultation by Dr. Calin Catarig veterinarian and owner of Rosslyn Veterinary Clinic located in Edmonton, Alberta in Canada. Many thanks to Dr. Catarig for providing the patient's history and these fantastic images! A 13-Minute SonoPodcast. Lindquist dissecting the "Shunt Hunt" image set to reach the diagnosis.